The Flex Profile Kit from Jeroen van de Kamp and his team in Holland is famous among server-based computing administrators throughout the world. In a nutshell, it provides a logon and logoff script-based alternative to using roaming profiles in a Citrix or Terminal Server environment. Version 5 of the kit is now available as an attachment to this article. Support for Windows MUI. The multilanguage user interface within Windows is now supported. Variable support for StoreRoot & StoreFolder. You can specify path variables in the framework.ini configuration file. Redundant OPS file removal. When an OPS (profile settings) file is not used anymore, it will automatically be removed. Improved FlexRefresh. No more annoying FlexRefresh messages during logon, no more IconSize bug, and FlexRefresh will now also update cursor settings. More Flexible Configuration. It is now possible to specify the full path to the other Framework.ini as a third command line option. This allows the possibility of having multiple configurations. 2x Faster Logon. Although there have not been too many complaints :-), a bug in the logon process caused it to load the all the OPS files twice (oops!). This has now been fixed, reducing the logon time by 50%! A GUI!!! 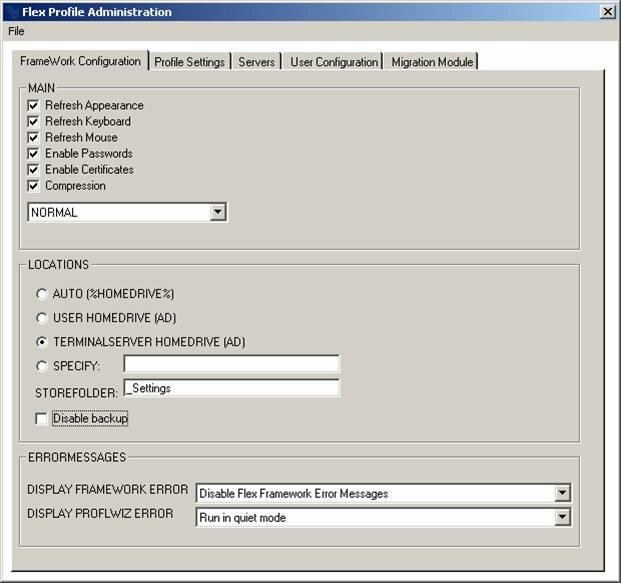 The Flex Framework can now be configured with the FlexConfig.exe tool written by Magnar Johnsen! I've downloaded the Flex Profile ver 5 and have gone over the install directions, followed the instructions to the letter and have this working well with my admin account. Now with everything in place i've added a new user to this test enviroment and am unable to get the Flex_framework.vbs to run; it comes up with access denied. When i add the new account to the local admin group it works. In the documentation it does not specify any particular rights or permissions to be able to use this so i'm a little confused. Any ideas? You've locked something down, most likely through GPO. Run filemon, regmon from http://www.sysinternals.com to find where the problem is.